Sarah Palin's solution to the California water crisis: You might ask, though, why dont they just fix the infrastructure problem, why dont they just build more reservoirs and plants? After all, California is a coastal state. Its got a whole ocean right there, water all around ya. Sarah Palin thinks Sputnik brought the Russian economy down. In an interview she said, ""Yeah, they won but they also incurred so much debt at the time that it resulted in the inevitable collapse of the Soviet Union," As Talking Points Memo notes, "While the Soviet Union did eventually collapse, that wasn't until 1991 -- a full 22 years after the U.S. put a man on the moon, and the collapse came amid stagnant economic growth after years of unsustainable Soviet defense spending of which its space program was a relatively small part." Sarah Palin: "We need to cut these things that aren't constitutionally mandated, that are kind of on the periphery, the fluffery, like NPR and National Endowment for the Arts." 'Its a difficult situation, this is that 3am White House phone call and it seems for many of us trying to get that information from our leader in the White House it it seems that that call went right to um the answering machine. And nobody yet has, no body yet has explained to the American public what they know, and surely they know more than the rest of us know who it is who will be taking the place of Mubarak and Im not real enthused about what it is that thats being done on a national level and from DC in regards to understanding all the situation there in Egypt. And in these areas that are so volatile right now because obviously its not just Egypt but the other countries too where we are seeing uprisings, we know that now more than ever, we need strength and sound mind there in the White House. We need to know what it is that America stands for so we know who it is that America will stand with. And we do not have all that information yet." Why does the media never mention that Sarah Palin is America's first governor of more than 1200 since 1900 to desert her office in the first term for other than reasons of impeachment, scandal, illness, or appointment to a higher office? If she were elected president she would be the first politcal deserter to hold that office. Were on Sarah Palins targeted list, but the way she has it depicted has the crosshairs of a gunsight over our district. And when people do that, theyve gotta realize that theres consequences to that action. Criticizing Sarah Palin is now apparently a violation of the First Amendment.. Palin told WMAL-AM that her criticism of Obama's associations, like those with 1960s radical Bill Ayers and the Rev. Jeremiah Wright, should not be considered negative attacks. Rather, for reporters or columnists to suggest that it is going negative may constitute an attack that threatens a candidate's free speech rights under the Constitution, Palin said. "If [the media] convince enough voters that that is negative campaigning, for me to call Barack Obama out on his associations," Palin told host Chris Plante, "then I don't know what the future of our country would be in terms of First Amendment rights and our ability to ask questions without fear of attacks by the mainstream media." SARAH PALIN: "It's time for Americans across this great country to stand up and say, 'We're all Arizonans now,'" Does this mean we all have to carrry our birth cetificates when we go out our door? Bruce Wilson, Huffington Post - Sarah Palin endorser Bishop Thomas Muthee, in a speech he gave before blessing and anointing Sarah Palin as a political leader on October 16, 2005 at the Wasilla Assembly of God, laid out the current agenda of the New Apostolic Reformation - how "God's kingdom" needed to "infiltrate" seven sectors of society. Muthee listed most of them: business and finance, schools and education, media and entertainment, politics and government. The New Apostolic Reformation is not a small movement: an apostle of C. Peter Wagner, one of the 500 apostles in Wagner's International Coalition of Apostles, owns what will be one of the tallest buildings in the world, the Jakarta Tower. One of the NAR's branches is successfully supplanting the Catholic Church in Brazil. The movement holds international conferences on advancing Christian hegemony in the business sector. A new 36 page report from an independent research team that has specialized in studying Sarah Palin's faith, contains ground breaking information on a religious movement Sarah Palin is tied to and which advocates that its members "plunder" the wealth of the "godless". . .
Wayne Barrett, Village Voice - The #12.5 million sports complex and hockey rink that is the lasting monument to Palin's two terms as Wasilla mayor is also a monument to the kind of insider politics that dismays Americans of both parties. Six months before Palin stepped down as mayor in October 2002, the city awarded nearly a half-million-dollar contract to design the biggest project in Wasilla history to Kumin Associates. Blase Burkhart was the Kumin architect on the job - the son of Roy Burkhart, who is frequently described as a "mentor" of Palin and was head of the local Republican Party (his wife, June, who also advised Palin, is the national committeewoman). Asked if the contract was a favor, Roy Burkhart, who contributed to her campaign in the same time frame that his son got http://www.villagevoice.com/2008-10-08/news/the-book-of-sarah/5the contract, said: "I really don't know." Palin then named Blase Burkhart to a seven-member builder-selection committee that picked Howdie Inc., a mostly residential contractor owned at the time by Howard Nugent. Formally awarded the contract a couple of weeks after Palin left office, Nugent has donated $4,000 to Palin campaigns. Two competitors protested the process that led to Nugent's contract. Burkhart and Nugent had done at least one project together before the complex - and have done several since. A list of subcontractors on the job, obtained by the Voice, includes many with Palin ties. One was Spenard Builders Supply, the state's leading supplier of wood, floor, roof, and other "pre-engineered components." In addition to being a sponsor of Todd Palin's snow-machine team that has earned tens of thousands for the Palin family, Spenard hired Sarah Palin to do a statewide television commercial in 2004. When the Palins began building a new family home off Lake Lucille in 2002 - at the same time that Palin was running for lieutenant governor and in her final months as mayor - Spenard supplied the materials, according to Antoine Bricks, who works in its Wasilla office. Spenard actually filed a notice "of its right to assert a lien" on the deed for the Palin property after contracting for labor and materials for the site. Spenard's name has popped up in the trial of Senator Stevens - it worked on the house that is at the center of the VECO scandal as well. Todd Palin told Fox News that he built the two-story, 3,450-square-foot, four-bedroom, four-bath, wood house himself, with the help of contractors he described as "buddies." As mayor, Sarah Palin blocked an effort to require the filing of building permits in the wide-open city, and there is no public record of who the "buddies" were. The house was built very near the complex, on a site whose city purchase led to years of unsuccessful litigation and, now, $1.3 million in additional costs, with a law firm that's also donated to Palin collecting costly fees from the city. Dorwin and Joanne Smith, the principals of complex subcontractor DJ Excavation & Development, have donated $7,100 to Palin and her allied candidate Charlie Fannon (Joanne is a Palin appointee on the state Board of Nursing). Sheldon Ewing, who owns another complex subcontractor, Weld Air, has donated $1,300, and PN&D, an engineering firm on the complex, has contributed $699. Ewing was one of the few sports-complex contractors, aside from Spenard, willing to address the question of whether he worked on the house as well, but he had little to say: "I doubt that it occurred, but if it did indirectly, how would I know anyhow?" The odd timing of Palin's house construction - it was completed two months before she left City Hall and while she and Todd Palin were campaigning statewide for the first time - raises questions, especially considering its synergy with the complex. Salon's David Talbot recently visited the complex, which, he said, resembled "a huge airplane hangar" so far away from the city's center that kids can't bike or walk there. It's adorned by a plaque commemorating Palin. Even as a governor, she is still such a champion of the complex - which loses money every year - that she just steered state funding for a new kitchen to it. Greg Sargent, TPM Election Central - Sarah Palin attacked Obama's patriotism over his association with former Weatherman Bill Ayers -- a move that makes it perfectly legitimate to raise questions about the Palins' associations with a group founded by an Alaska secessionist who once professed his "hatred for the American government" and cursed our "damn flag.". . .
Sarah's husband, Todd Palin, was a member of this group, which continues to venerate that founder to this day, for years. The group is the Alaska Independence Party, which sees as its ultimate goal seceding from the union. Todd was a member, with a brief exception, from 1995 until 2002, according to the Division of Elections in Alaska. And though Sarah Palin herself was apparently not a member of this group, there's no doubt that she repeatedly courted this secessionist organization over the years. In 1994, Palin attended the group's annual convention, according to witnesses who spoke to ABC News' Jake Tapper. The McCain campaign has confirmed she visited the group's 2000 convention, and she addressed its convention this year, as an incumbent governor whose oath of office includes upholding the Constitution of the United States. The founder of the AIP was a man named Joe Vogler. Here's what he had to say in a 1991 interview, only a few years before Palin attended its convention: "The fires of hell are frozen glaciers compared to my hatred for the American government." He also said this: "And I won't be buried under their damn flag. I'll be buried in Dawson. And when Alaska is an independent nation they can bring my bones home." Vogler has also said: "I'm an Alaskan, not an American. I've got no use for America or her damned institutions." McCain apologists will argue that Sarah Palin was not a member of this group. But Obama wasn't a member of any Ayers anti-American group, either. And again, Palin repeatedly courted the AIP, and her husband was a member for years. Bruce Wilson, Alternet - Sarah Palin's churches are actively involved in a resurgent movement that was declared heretical by the Assemblies of God in 1949. This is the same 'Spiritual Warfare' movement that was featured in the award winning movie, "Jesus Camp," which showed young children being trained to do battle for the Lord. At least three of four of Palin's churches are involved with major organizations and leaders of this movement, which is referred to as The Third Wave of the Holy Spirit or the New Apostolic Reformation. The movement is training a young "Joel's Army" to take dominion over the United States and the world. . . The Wasilla Assembly of God church is deeply involved with both Third Wave activities and theology. . . The pastor, Ed Kalnins, and Masters Commission students have traveled to South Carolina to participate in a "prophetic conference" at Morningstar Ministries, one of the major ministries of the Third Wave movement. Becky Fischer was a pastor at Morningstar prior to being featured in the movie "Jesus Camp." . . . The Third Wave is a revival of the theology of the Latter Rain tent revivals of the 1950s and 1960s led by William Branham and others. It is based on the idea that in the end times there will be an outpouring of supernatural powers on a group of Christians that will take authority over the existing church and the world. The believing Christians of the world will be reorganized under the Fivefold Ministry and the church restructured under the authority of Prophets and Apostles and others anointed by God. The young generation will form "Joel's Army" to rise up and battle evil and retake the earth for God. While segments of this belief system have been a part of Pentecostalism and charismatic beliefs for decades, the excesses of this movement were declared a heresy in 1949 by the General Council of the Assemblies of God, and again condemned through Resolution 16 in 2000. . . The Third Wave, also known as the New Apostolic Reformation, is a network of Apostles, many of them grouped around C. Peter Wagner, founder of the World Prayer Center. This center, which was built in coordination with Ted Haggard and his New Life Church in Colorado Springs, was featured in an article by Jeff Sharlet in Harpers, May 2005, "Soldiers of Christ." Sharlet was one of the first to write in the secular press about the World Prayer Center which is often referred to by those familiar with the Third Wave as the 'Pentagon for Spiritual Warfare.' It features computer systems that store the data of communities around the world, mapping out unsaved peoples' groups and spiritual mapping information for spiritual warfare. . .
Wagner's top leaders often conduct spiritual warfare campaigns against the demons that block the acceptance of their brand of Christian belief, such as 'Operation Ice Castle' in the Himalayas in 1997. Several of their top prophets and generals of intercession spent weeks in intensive prayer to "confront the Queen of Heaven." This queen is considered by them to be one of the most powerful demons over the earth and is the Great Harlot of Mystery Babylon in Revelation. (The "Great Harlot [or 'whore'] of Mystery Babylon" theme also figures prominently in the sermons of Texas megachurch pastor and Christians United For Israel founder John Hagee, former endorser of John McCain's 2008 presidential bid.) . . . The Third Wave movement is cross-denomination and is not synonymous with any specific denomination, nor is it synonymous with Evangelical or Fundamentalist. Although the movement emerged from Pentecostalism, it draws its support from a variety of denominations and religious streams. They believe they are forming a post-denominational church to take the world for the end times. To date, all of the writing and objections to this movement have emerged from other Evangelicals and Fundamentalists who believe the movement to be unbiblical. Also, it is other conservative churches that refuse to embrace the 'outpouring of the Spirit' that are targets of much of the anger of the movement. William Yardley, NY Times - The traditional turning points that had decided municipal elections in this town of less than 7,000 people - Should we pave the dirt roads? Put in sewers? Which candidate is your hunting buddy? 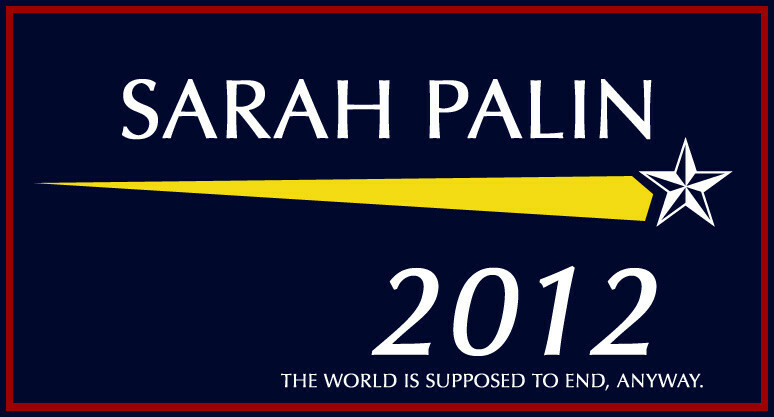 - seemed all but obsolete the year Ms. Palin, then 32, challenged the three-term incumbent, John C. Stein. Anti-abortion fliers circulated. Ms. Palin played up her church work and her membership in the National Rifle Association. The state Republican Party, never involved before because city elections are nonpartisan, ran advertisements on Ms. Palin's behalf. . .
Talkng Points Memo - The founder of the Alaska Independence Party -- a group that has been courted over the years by Sarah Palin, and one her husband was a member of for roughly seven years -- once professed his "hatred for the American government" and cursed the American flag as a "damn flag." The AIP founder, Joe Vogler, made the comments in 1991, in an interview that's now housed at the Oral History Program in the Rasmuson Library at the University of Alaska, Fairbanks. Palin supports gunning down wolves from planes. . .
Palin doesn't believe global warming is man-made. . . According to the Washington Post, "Sarah Palin told voters there she wasn't sure climate change wasn't simply part of a natural warming cycle." Palin told the conservative Web site NewsMax, "I'm not one . . . who would attribute it to being man-made." Palin Tried to Ban Books From Local Library. . . Time reports that as mayor Palin asked the town librarian how to go about banning books from the local library. News reports from the time show that the librarian, who, strangely enough, was opposed to a tactic commonly employed by totalitarian regimes, had her job threatened for not giving her "full support" to the mayor. Palin Apparently Doesn't Put 'Country First' . . . Officials of the Alaskan Independence Party say that Palin was once so independent she was once a member of their party, which since the 1970s has been pushing for a legal vote for Alaskans to decide whether or not residents of the 49th state can secede from the United States. And while McCain's motto -- as seen in a new TV ad -- is "Country First," the AIP's motto is the exact opposite -- "Alaska First - Alaska Always." From the age of 12 and for most of her adult life, Sarah Palin attended the Wasilla Assembly of God. . . The Huffington Post writes that the Church's preacher Ed Kalinins "preached that critics of President Bush will be banished to hell; questioned whether people who voted for Sen. John Kerry in 2004 would be accepted to heaven; charged that the 9/11 terrorist attacks and war in Iraq were part of a war 'contending for your faith;' and said that Jesus 'operated from that position of war mode.' [Said Kilinins], "What you see in Iraq, basically, is a manifestation of what's going on in this unseen world called the spirit world. We need to think like Jesus thinks. . . Jesus called us to die. You're worried about getting hurt? He's called us to die." In an address to the church three months ago, Palin also used disconcertingly religious language to frame the conflict in Iraq: "Pray for our military men and women who are striving to do what is right. Also, for this country, that our leaders, our national leaders, are sending [U.S. soldiers] out on a task that is from God," she exhorted the congregants. "That's what we have to make sure that we're praying for, that there is a plan and that that plan is God's plan." Matthew Mosk, Washington Post -- In addition to being a mayor and raising four children, Sarah Palin found time for another venture in her Wasilla years -- she was part-owner of an Anchorage car wash. Palin and husband Todd each held a 20 percent stake in Anchorage Car Wash LLC, according to state corporation records filed in 2004. A review of Palin's gubernatorial disclosure filings indicates that she failed to report her stake in the company on the form that requires candidates for governor to disclose any interest in a non-publicly traded company. . .
A Feb. 11, 2007 letter to the governor's business partner advises that the car wash had "not filed its biennial report and/or paid its biennial fees," which were more than a year overdue. The warning letter was written on state letterhead, which carried Palin's name at the top, next to the state seal. Telegraph, UK - Sarah Palin's record in office is facing increasing scrutiny after it emerged that she misled Republican supporters when she was presented to the nation as Senator John McCain's running mate. Mrs Palin told a cheering audience in Ohio that she had turned down an offer from the US Congress to build the so-called "Bridge to Nowhere", which would have connected Gravina Island with Ketchikan International, an airport in Alaska's southeast serving just 200,000 passengers a year. Mr McCain routinely cites the project as a symbol of wasteful central government spending. As she introduced herself to Republicans and the American public on Friday, the virtually unknown Mrs Palin said: "I championed reform to end the abuses of earmark spending by Congress. In fact, I told Congress ... 'thanks, but no thanks' on that bridge to nowhere. If our state wanted a bridge, I said we'd build it ourselves." Asked "would you continue state funding for the proposed Knik Arm and Gravina Island bridges?" she replied: "Yes. I would like to see Alaska's infrastructure projects built sooner rather than later. The window is now - while our congressional delegation is in a strong position to assist." Ken Silverstein and Sebastian Jones, Harpers - During the 2008 campaign the beliefs of various candidates' pastors has attracted a great deal of attention, especially the Reverend Jeremiah Wright, as well as John Hagee, who endorsed John McCain. So now seems a good time to examine the viewpoints of Sarah Palin's two most recent pastors, as expressed in their sermons. Since becoming governor in 2006, Palin has attended the Juneau Christian Center, where Mike Rose serves as senior pastor. Her previous pastor was David Pepper of the Church on the Rock in Palin's hometown of Wasilla - a church that "was kind of a foundation for her.". . .
From a April 27, 2008 sermon: "If you really want to know where you came from and happen to believe the word of God that you are not a descendant of a chimpanzee, this is what the word of God says. I believe this version." From a July 8, 2007 sermon: "Those that die without Christ have a horrible, horrible surprise." From a July 28, 2007 sermon: "Do you believe we're in the last days? After listening to Newt Gingrich and the Prime Minister of Israel and a number of others at our gathering, I became convinced and I have been convinced for some time. We are living in the last days. These are incredible times to live in." to glorify God. This nation is a Christian nation." From a October 28, 2007 sermon: "God will not be mocked. I don't care what the ACLU says. God will not be mocked. I don't care what atheists say. God will not be mocked. I don't care what's going on in the nation today with so much horrific rebellion and sin and things that take place. God will not be mocked. Judgment day is coming. Where do you stand?" You can't serve both man and God. It is one or the other."